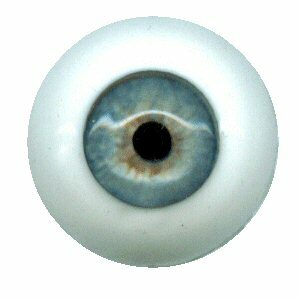 Masterpiece Eye Company is the ORIGINATOR OF THE SOFT "GLASS" FLEXIBLE DOLL EYES. "For 27 years Our handmade eyes are used by many of the world's leading doll artists as well as those just starting out; in modern as well as antique reproduction dolls. Because our eyes are flexible eyes they will fit perfectly every time, even when beveling is poor." Masterpiece eyes are called soft "glass" because they are made of silicone and glass. ME guarantee their eyes never to change color or degrade over time. To measure for your doll's eyes, measure from corner to corner of the eye cavity in millimeters. Add 2mm to this total. That is the size to order. ME use an odd numer to fill up the eye cavity better. The larger size only affects the white part of the eye, not the iris. If you would like to order an 18mm eye, you will order a 19mm eye. I chose to carry Masterpiece eyes because of their excellent quality and terrific customer service.